Easily schedule, start and track your conference calls with the integrated Outlook® Plug-in. Get started by following these simple instructions today. 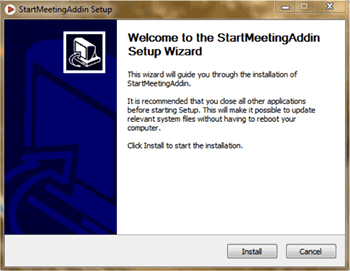 Note: StartMeeting.com account log in credentials (email and password) are required to complete the download. If you do not have an account, Contact Us. Step 2: Open the file and click Install. Step 3: Click Finish to complete the installation. Step 4: Open Outlook and click Meet Now to log in to your account. 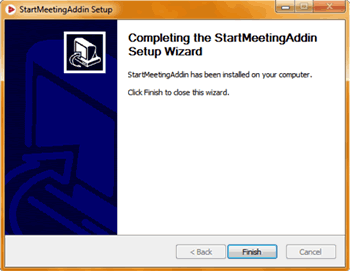 Step 5: Enter your StartMeeting Login (email address) and Password to link your account to Outlook. Step 6. To schedule a meeting, click StartMeeting, then Schedule a Meeting. Step 7. An Appointment will open that is pre-populated with your meeting information. You can then set the date and time, as well as add participants by clicking Invite Attendees.